This succulent bonsai, also known as the "Elephant Bush", is native to South Africa and has leaves that are almost round and about one-third the size of the common Jade plant. The fleshy trunk, branches, and leaves are used to store water. 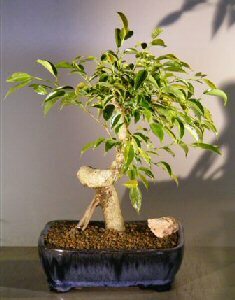 Difficult to find in its variegated form and makes an excellent bonsai tree for the home or office. The Neem tree is considered to be one of the most promising trees of the 21st century. It has great potential in the fields of pest management, environmental protection and medicine. Used widely as a bio-pesticide for organic farming, as it repels a wide variety of pests, including the mealy bug, aphids, ants and mosquitoes. Use as a repellent and larvacide. Neem oil also controls black spot, powdery mildew and fungus. Dilute at the rate of 4 teaspoons per gallon of water. Adding a surfactant, such as liquid diswashing soap, will enhance its effectiveness. Great for all bonsai trees and household plants.